Architecture: These two items appeared separately in the original version of the Around Naples Encyclopedia and have been consolidated onto a single page here. For other items about architecture, see the architecture portal. When the Spanish broke out of the confines of the original city walls and moved west out to what is now the Riviera di Chiaia, they put up an impressive string of villas along what was then the seafront. (The more recent park, built by the Bourbons and now known as la Villa Comunale (The Public Gardens) now lies between the original villas and the water.) Most of those villa now have similar histories of being turned to uses other than housing dukes and princes. Palazzo Carafa di Roccella (photo, below) is an interesting example. It sits two blocks back from the Riviera di Chiaia on one of the main shopping streets, via dei Mille, in the Chiaia section of town. It is an enormous red building, a block long and four or five stories high, and it has been abandoned and had scaffolding on the façade for as long as I can remember—sort of a permanent suggestion that they might be getting ready to do something with it some day. Now, however—apparently, while I wasn’t looking—the construction cranes have almost finished their job, the paint is almost dry, “some day” is here, and the plan is for this old, old building to house a new museum of modern art. They did it! It's finished and open (photo, right). It goes by the slightly too clever acronym of PAN—Palazzo delle Arti Napoli—but who cares. It's finished—6,000 square meters on 3 floors, dedicated to contemporary and modern art. Complete with book shop and coffee bar, PAN is now part of the overall Neapolitan museum complex that includes the Royal Palace, National Archaeological Museum and the Capodimonte museum. The current website for PAN is here. It is in English and is well written and thorough. PAN is currently (Nov.6, 2015) featuring an exhibit dedicated to Cesare Andrea Bixio (b.Naples, 1896 – d.Rome,1978). The exhibit is entitled "Musica e cinema nel '900 italiano" [Italian music and cinema of the 1900s]. Generally, Bixio was certainly one of the most popular Italian songwriters of the 1930s, '40s, and '50s. More specifically, he is often called the founder of modern Italian popular music. (For comparison, think of the place occupied by Jerome Kern in American popular music.) Resisting his parents' wishes that he study the sciences and become an engineer, Bixio taught himself to play the piano and by the age of 13 was composing melodies for many well-known Neapolitan lyricists and poets. As an impresario and composer, he founded a music publishing company in Naples in 1920 and then moved it to Milan when he left Naples; it became the first music publishing house in Milan. He was responsible for the sound track of La Canzone dell'Amore, the first Italian sound film (1930). His compositions include Parlami d’amore Mariù, Mamma, Vivere, Violino Tzigano, Il tango delle capinere, La canzone dell’amore, Portami tante Rose, and many others. Interestingly, many of them lent themselves to being sung (and were in fact recorded) by "heavier" operatic voices of the likes of Beniamino Gigli and Luciano Pavarotti, for example. (As unusual a surname as 'Bixio' is in Italian, perhaps more curious is that fact that one lyricist with whom he collaborated had the same name as a given name, one Bixio Cherubini!) The exhibit at PAN will display posters, photos, music manuscript and scores, film clips and videos and will also feature recordings. The exhibit runs through Jan 10, 2016. The worst place to put a building like this. Like most people who know nothing of what they spout off about, I know what I like, and of all the chunks of so-called architecture I don't like in Naples, the Jolly Hotel downtown (photo, left) is at the top of my list. This grotesque people-box looks as if some brain-dead band of miscreants first built a tawdry one–story hick motel and then decided to pancake fifteen of them straight up. They even put a neon sign on top. “Jolly,” it says. Only Italians know that the “Jolly” is the Joker in a deck of cards. Visitors from elsewhere no doubt think that this the place to come to get your jollies. If I had real power, I would contact the aliens who wasted so much valuable time mutilating cattle in the Rockies and kidnapping FBI agents for The X-Files and get them to abduct the architects of this monstrosity and hurt them real good, and then zap that baby straight into the center of the sun. While they're at it, the aliens can take the bottom station of the Chiaia cable–car at Piazza Amedeo. That used to be a quaint turn–of–the–century cable–car station, a sweet little number that cradled you while you waited and let you forget about traffic jams and such. Then, they tore it down and put up a concrete and steel–girder station. At least they tried to put one up, because when the people in the adjacent apartment house saw the Quonset Hut from Hell inching up next door, they sued the city to stop construction. They won their case, but in its infinite delay the law didn't stop the building until the steel beams were inches from the windows in the apartment building. For well over a year, tenants couldn’t leave their windows open without feeling that this skeleton with a corrugated tin hat was leering in at them. (The law was finally translated into action. The steel girders are gone and residents can now glance out and have an unobstructed view of what is left of the station.) If the station had been finished as designed, it was surely destined to wind up like its sibling, the cable–car station of the Montesanto line in the Vomero section of town. This thing looks like what you get when you sneak up on the Führerbunker and spray it with shaving cream. The aliens can have that one, too. update: Oct. 2013- The Chiaia cable-car has been finished and open for a few years. The evil architects of the hideous lost this one! The bottom and top stations were redone in their delightful 1890s Art Nouveau style. As well, the bottom station of the Montesanto station was opened a few years ago, also in retro style. Also, the top station was redone away from its concrete Brutalist style. Now it looks fine. 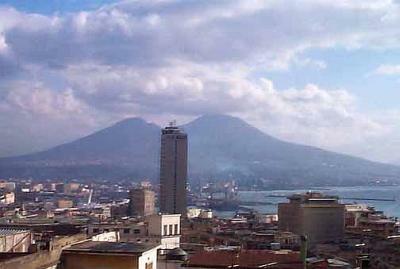 See this general entry for a map and information on all four cable-cars in Naples. 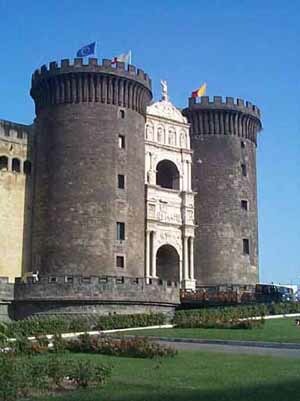 On the other hand, I like the castle at the port of Naples (photo, left). It's good solid fourteenth–century monolithic fortress architecture. It has what every twelve–year–old boy could ask for in a building: crenels, merlons, battlements, arrow loopholes, bastions, casemates, turrets, and a moat. A moat, for Pete's sake! One that used to have crocodiles in it! (I realize that story is not true, but I enjoy repeating it.) Sadly, cars now park where crocodiles used to prowl, but that is not the fault of the fortress. I also like the Galleria Umberto across from the San Carlo opera house. It's an 1890 hybrid of a shopping mall and a cathedral, a glass and girder dome sheltering four vast naves below. Its construction was a boon to that part of town and it is still a kind of sitting–room for the city; you wander in, have a coffee, check out the shops, and if you go on Saturday or Sunday mornings, maybe even wind up as an extra in a film, since the Galleria is the place where local directors rightfully figure they can find at least a few suitably strange characters such as yourselves. Now that I am being opinionated and Philistine about architecture, here is some more—and I know the hard time I am going to get on this. I like the architecture of Fascism in Naples. Now, it is no secret that from the Great Pyramid of Cheops to Louis XIV's Palace at Versailles, big governments build big. Nor does it take any profound symbol–crunching to understand architecture as extension of the tyrant's ego. Yet, in our own century, this kind of fervor has produced such ugliness that the results would be funny if they didn't remind us of the grim realities that accompanied them. I'm thinking primarily of the architectural corn that Hitler planted in Germany in the 1930s, replete with over–sized statues of Siegfried. Almost as bad were the grim mastodons of Socialist Realism in the Soviet Union—a succession of joyless, clumsy and intimidating buildings put there, no doubt, to remind you to shut up. The Italian examples of totalitarian architecture—at least the ones I have seen in Naples—don't strike me that way at all. Yes, they are big, but they are big and shining and optimistic. 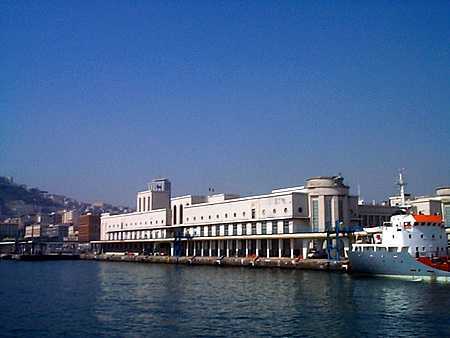 The great white passenger terminal at the port of Naples (photo, left), finished in 1936, looks, itself, like some magnificent vessel about to set sail. 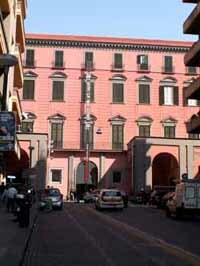 The main post–office at Piazza Matteotti is the best example, however. It could be a set from the science–fiction film of the 1930s, Things to Come. (The post-office was, in fact, completed in 1936, also known—as the friendly inscription on the side reminds us—as "Year XIV of the Fascist Era". That inscription was recently restored such that it is completely and un–selfconsciously legible.) The great smooth black and white marble façade is lined with row after row of rectangular windows, so symmetrical and unmoving that the building itself looks entranced. At first glance, it might all be one giant tribute to the static perfection of the right-angle—in short, a big box. Yet, that is deceptive, for the smooth façade curves into the entrance, producing two pseudo–columns almost as tall as the building, itself, and the entire considerable length of the building is actually a gigantic curve. Thus, instead of flatness, we have some three–dimensional geometry of straight lines and curves. Surely, this is what a space station should look like. The post–office is, indeed, art–deco, that "futuristic" style from the 1930s, the clean, simple forms of which kept cropping up at exhibitions and World's Fairs of that decade, telling us what the world would look like fifty years down the road. One 1930–ish prediction missing from the main post–office, I suppose, is a transparent people–moving tube, high above ground, leading away from the building, perhaps in the direction of the spaceport or the planetary weather control station. And in place of the personal electric helicopters zipping about in front, there is a real live 2003–ish traffic jam. But just as with the fortress down at the harbor, that's not the fault of the building.